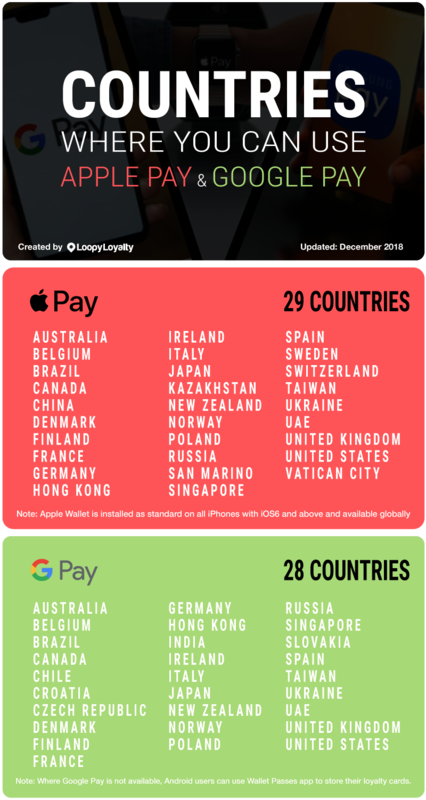 List of countries that support Apple Wallet and Google Pay. Apple Wallet is a native application that is installed (and cannot be deleted) in all iPhones that have iOS6 and above (so basically all iPhones). It is available in globally. While the application, Apple Wallet, is available globally we do find that customers are more familiar where Apple Pay has been rolled out. i.e. Customers can add their credit card to Apple Wallet and use it to make payments. But please note that a customer does not have to use Apple Pay to add your card to the wallet. Because there are many 'flavours' of Android, Google Pay (wallet) is not installed as standard and typically is only available where Google Pay has been rolled out. This means in countries wherever a customer can add their credit card to Google Pay. Once a customer has added a credit card to Google Pay, the application cannot be deleted. Loopy Loyalty is available in every country.